Every member of our society has a place. No matter what color, gender, or ability level, we’re all equally important and capable of greatness. The United States realized long ago that individuals with disabilities have just as much to contribute to our workforce as those without do. It was then that National Disability Employment Awareness Month (NDEAM) really began. As we celebrate the 70th anniversary of NDEAM, we’ll take a look back at it’s history and share with you how you can observe this month with us. 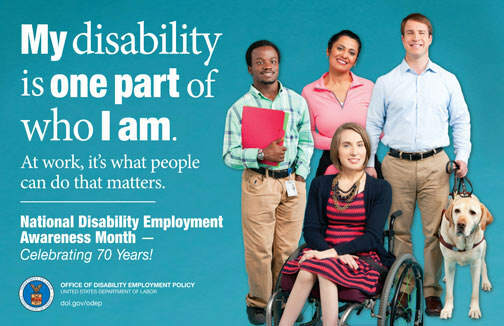 National Disability Employment Awareness Month began as a means of raising awareness and advocating for the employment of people with all kinds of disabilities. It came in the aftermath of WWII, when many injured soldiers were coming home only to find that their injuries would make certain kinds of jobs difficult and, in some cases, physically not possible. On August 11th, 1945, President Harry S. Truman approved a resolution declaring the first week of October to be “National Employ the Physically Handicapped Week.” Realizing that disabilities can be mental or emotional, and not just physical, in 1962 the word “physically” was removed from the title. This would later become National Disability Employment Awareness Month as we know it, and would be the inspiration for a number of congressional acts and laws designed to provide individuals with disabilities equal employment rights. Decades later, and this initial resolution gave birth to the biggest disability advocacy act in American history. On July 26th 1990, President George H. W. Bush signed into law the Americans with Disabilities Act. Now in it’s 25th year, the ADA has made discrimination against those with disabilities in the workplace a thing of the past. Workers with any kind of disability are able to enjoy all the same privileges and perks of employment that their peers do, including workers’ compensation, job training, and more. The theme for this year’s National Disability Employment Awareness Month is “My Disability is One Part of Who I Am.” The theme is meant to discourage looking at disabilities as a defining characteristic of any one person. We’re all humans, people, and Americans, and when you boil it down, we’re all made up of hundreds of character traits, physical features, and cognitive abilities that make us each unique. There are a number of ways you as an individual, or with the help of your company, can participate in NDEAM. Below are just a few suggestions. You can find details about these. Share the NDEAM Poster on Social Media: Creating awareness is a huge part of what has made NDEAM so successful. Sharing this year’s poster on social media outlets like Facebook and Twitter helps others to get involve and opens the door for more conversations about disabilities and accessibility. Catch Up on More NDEAM History: In addition to what we covered in our history section, there were many more pivotal laws and decisions made over the course of the last 70 years that have gotten us where we are now in regards to the fair employment of those with disabilities. If you’re interested in learning more, check out the U.S. Department of Labor’s interactive disability employment history timeline. Check Out the Workforce Recruitment Program: The WRP is a recruitment program that pre-screens college students and graduates with disabilities who are looking for full time or internship work. The Workforce Recruitment Program provides more chances for these highly motivated students and allows employers to diversify their workplace in the process. Watch and Share the “Because” PSA: A picture is worth a thousand words, and the Department of Labor’s “Because” PSA is worth far more. Again, materials like this serve the purpose of educating others and spreading awareness of the NDEAM cause. Take Part in Disability Mentoring Day: Your employer can participate in Disability Mentoring Day by signing up here. This event provides opportunities for children with disabilities to spend time in workplaces, take part in job shadowing, and receive advice and mentoring from business leaders and entrepreneurs. We hope you’ve enjoyed learning a bit more about National Disability Employment Awareness Month and are now better equipped to be a part of the advancement of this groundbreaking initiative. The United States Department of Labor offer a number of resources for companies and businesses who want to include themselves in the celebration. We encourage you to become a part of the movement and to learn more about fair employment for individuals with disabilities.